Fishermen Caught With 6,600 Sharks In Galápagos, Now Headed To Prison : The Two-Way The dead sharks, mostly endangered hammerheads, were part of a 300-ton haul of fish found on a Chinese boat off the Galápagos Islands. An Ecuadorean judge fined and jailed the crew up to four years. 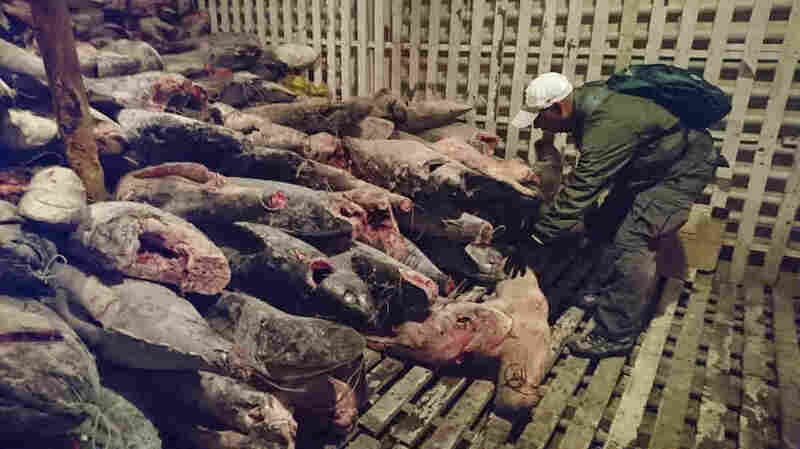 These dead sharks were discovered aboard a Chinese-flagged vessel found off Ecuador earlier this month with some 300 tons of marine species, several of which are in danger of extinction. When Ecuadorean authorities boarded the Fu Yuan Yu Leng 999 earlier this month off the Galápagos Islands, they had little idea what awaited them. Officials at the Galápagos National Park had called in the navy to investigate the Chinese-flagged vessel, which had been sailing through the area's marine reserve without explanation. It didn't take long to find the cargo. Roughly 300 tons of marine species lay heaped in piles onboard, including more than 6,600 dead sharks. Most of those were hammerheads, but authorities also found silky, thresher and mako sharks as well — all of which are off-limits to industrial fishers within the marine reserve. Now, after a brief trial on the Galápagos' San Cristobal Island, an Ecuadorean judge has convicted the ship's 20 crew members of possessing and transporting protected species. The ruling Monday sentenced them to anywhere from one to four years in prison and slapped them with fines totaling $5.9 million. "The sentence marks a milestone in regional environmental law and an opportunity to survive for migratory species," the country's Ministry of Environment said in a statement. 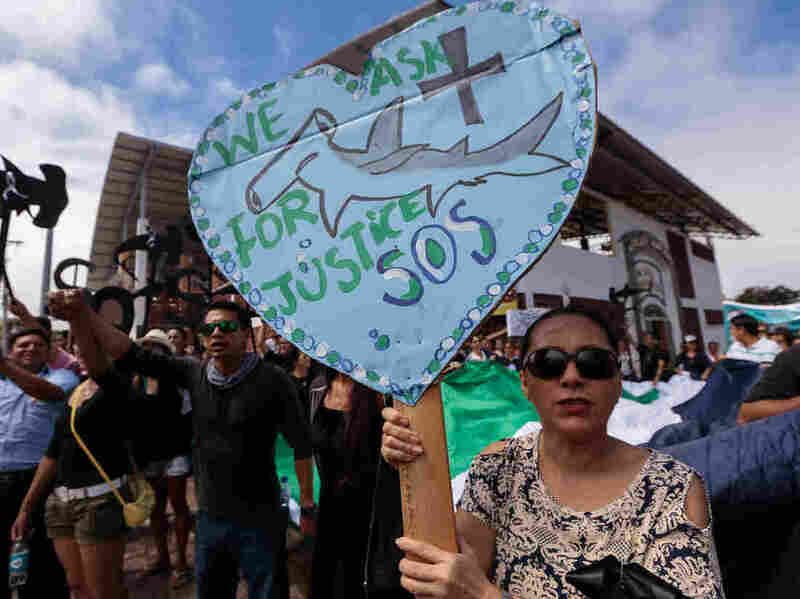 It also marks something of a vindication for the large crowd of demonstrators who showed up outside the courtroom last week, signs in hand, to protest illegal fishing around the Galápagos Islands. Fishing of any kind is banned throughout much of the area, which is home to one of the world's largest marine reserves. UNESCO says the world heritage site comprises more than 50,000 square miles of protected waters, and, according to National Geographic, it has "the highest abundance of sharks known in the world." "The Galápagos Islands have extraordinary ecological value, and also economic value," President Rafael Correa said last year after adding a new sanctuary to the reserve. "[It's a] wonderful world where as many species as possible are preserved for the enjoyment and knowledge of future generations." Residents of the Galápagos Islands demonstrate outside the court where the crew of the Chinese-flagged ship had a hearing last week. The Ecuadorean navy earlier this month seized the ship, which had been carrying some 300 tons of fish, including several endangered species such as the hammerhead shark. Yet the global trade in shark fins remains a burgeoning business, partly driven by efforts "to satisfy the expensive Asian dish shark fin soup," Costa Rica marine biologist Geiner Golfin told Quartz. That's despite some attempts from Beijing in recent years — laid out earlier this year by NPR's Anthony Kuhn — to cut down on the trade. Chinese leadership says it has been following the case in Ecuador. "We will not condone illegal fishing in any form," Chinese Foreign Ministry spokeswoman Hua Chunying said at a news briefing Tuesday — yet she noted that the Chinese government has conducted some investigations of its own to verify the Ecuadorean determination. "Judging from the information gleaned from the two sides, there has been no evidence proving that the vessel was engaged in fishing and transporting in the Ecuadorean waters," she said, adding that it was true the vessel was in the marine reserve, "unaware of the relevant rules." That said, she did not offer her own judgment on the ruling, saying only that Beijing plans to carry out its own "due investigation" and professing hope that Ecuadorean authorities "will deal with this case in a just and unbiased way based on the objective facts."